The Building in Context Toolkit consists of guidance and practical advice for local authorities to enable them to further develop areas of historic importance without detracting from their quality. The Building in Context Toolkit grew out of the publication Building in Context™ published by EH and CABE in 2001. The purpose of that publication was to stimulate a high standard of design for development taking place in historically sensitive contexts. The founding and enduring principle is that all successful design solutions depend on allowing time for a thorough site analysis and character appraisal to fully understand context. It is true that there is a subjective element in judgements about design quality but differences of opinion and matters of personal taste should not be allowed to obscure the fact that it is possible to arrive at opinions about design quality that are based on objective criteria. There are many ways of doing this, but any such process is likely to include asking questions based on the following principles. These principles encompass both the quality of the building itself and development as a contribution to the urban design of the neighbourhood in which it is situated. A successful project will start with an assessment of the value of retaining what is there. A successful project will relate to the geography and history of the place and lie of the land. A successful project will be informed by its own significance so that its character and identity will be appropriate to its use and context. A successful project will sit happily in the pattern of existing development and the routes through and around it. A successful project will respect important views. A successful project will respect the scale ofÂ neighbouringÂ buildings. A successful project will use materials and building methods which are as high quality as those used in existing buildings. A successful project will create new views and juxtapositions which add to the variety and texture of the setting. © Barefoot and Giles Architects. 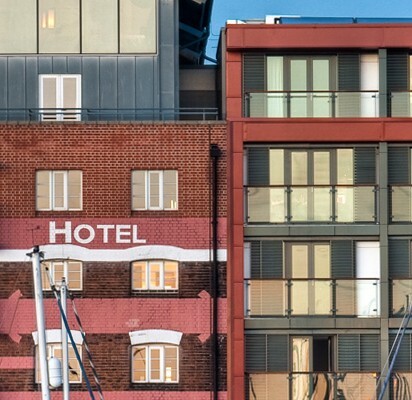 An 1800s warehouse building in Ipswich has been restored as part of the Neptune Marina refurbishment and is now The Salthouse Harbour Hotel.